Michael E Beals is a metal art sculptor whose work is unique and intuitive. All of his designs are original, one of a kind creations. Mike uses bells as metaphors for life, passage of time, and a celebration of life. Ring the bell in the morning as a celebration of the day and ring the bell in the evening as a thank you for the day. 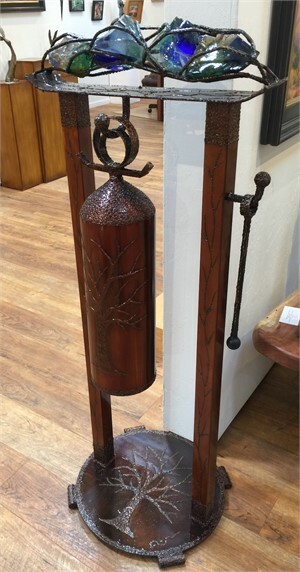 Mike’s distinct sculptures range in size from indoor entry way tabletop to outdoor garden pieces and all incorporate a ringable handcrafted bell in each sculpture. The use of stone and glass in his works connects our spirits to the journey of life. Each piece incorporates an item from the past and an element of the present. Mike gained his true love of the outdoors and creating his art forms from residing in the wilderness of Alaska for the past 15 years and was inspired by his older brother to begin welding. In addition to his brother’s inpiration of welding, Mike met with other artists pioneering the art form of metal sculpting which has led to his unique style. Mike feels art is an expression of one’s past and by creating metal sculptures he leaves his expression for the future to enjoy. Each piece is timeless. Mike resides part time working in his studio in Apple Valley, Utah; close in proximity to Zion Nation Park- a wonderful land of color with spiritual inspiration. Michael E Beals is a metal art sculptor whose work is unique and intuitive. All of his designs are original, one of a kind creations. Mike uses bells as metaphors for life, passage of time, and a celebration of life. Ring the bell in the morning as a celebration of the day and ring the bell in the evening as a thank you for the day. 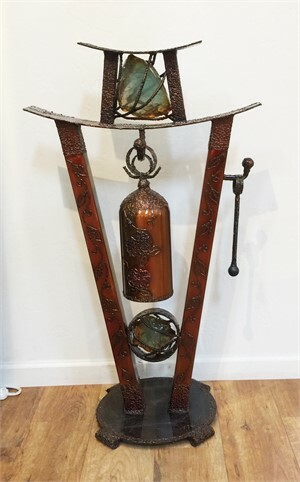 Mike’s distinct sculptures range in size from indoor entry way tabletop to outdoor garden pieces and all incorporate a ringable handcrafted bell in each sculpture. The use of stone and glass in his works connects our spirits to the journey of life. Each piece incorporates an item from the past and an element of the present. Mike gained his true love of the outdoors and creating his art forms from residing in the wilderness of Alaska for the past 15 years and was inspired by his older brother to begin welding. In addition to his brother’s inpiration of welding, Mike met with other artists pioneering the art form of metal sculpting which has led to his unique style. Mike feels art is an expression of one’s past and by creating metal sculptures he leaves his expression for the future to enjoy. Each piece is timeless. Mike resides part time working in his studio in Apple Valley, Utah; close in proximity to Zion Nation Park- a wonderful land of color with spiritual inspiration.